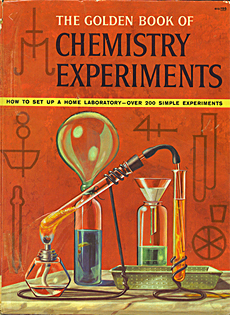 The Golden Book of Chemistry Experiments was a children’s chemistry book written in the 1960s by Robert Brent and illustrated by Harry Lazarus, showing how to set up your own home laboratory and conduct over 200 experiments. The book is controversial, as many of the experiments contained in the book are now considered too dangerous for the general public. There are apparently only 126 copies of this book in libraries worldwide. Despite this, its known as one of the best DIY chemistry books every published. It was also a source of inspiration to teenager David Hahn, who tried to collect a sample of every chemical element and also built a model nuclear reactor in his back shed in the 1990’s. Because it was published in 1960, before the US copyright laws were rewritten, and the original copyright was never renewed, it’s legal now to share it with you online. OpenMaterials has cached it here, and you can also download it from scribd. The pdf contains 114 scanned pages and is 27.9mb. R there any more information about this?